Green Air Heating and Air Conditioning, Inc. has been in business since 2007 but draws on more than 32 years of experience from our staff. We understand that you have unique needs so you can expect that we’ll provide you with products and services specifically designed to take care of your requirements. No one-size-fits-all solutions here! As your energy solutions company, Green Air aims to provide you with durable, high-efficiency systems, helping you reduce your energy costs. Want to go further and reduce your dependence on the grid? We can also aid you by implementing systems that will allow you to generate your own heat and electricity, tapping into solar power or other forms of renewable energy. As part of installing, maintaining, and repairing residential and commercial HVAC systems, we cover concerns related to heating, air conditioning, radiant, duct work, and air quality. Heating and cooling greatly affect indoor comfort levels but what many don’t realize is how crucial air quality is as well. Considering how much time you spend indoors, you also have to be mindful of the air you breathe, ensuring it is free from airborne pollutants, such as bacteria, dust, and mites. Green Air can help you with that. Aside from offering top-notch HVAC solutions, Green Air also provides customized solar panel designs with award-winning installation services and is a Certainteed-certified Master Elite Contractor and Green Roofer. Expert Solutions. No Compromises. Contact Us Today! To learn more about what we can do for you, just give Green Air a call at (925) 62-SOLAR or (925) 28-GREEN. We also have an online contact form you can use to get in touch with us. 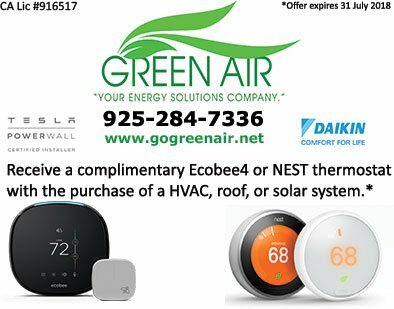 Green Air primarily serves the Greater Bay Area, offering HVAC, solar, and roofing solutions to customers in Concord, CA and the surrounding communities.